Director Nikolaj Arcel and co-writer Rasmus Heisterberg – deserving winners at the Berlin International Film Fest – have cultivated a patient and affecting historical drama out of the context of enlightenment-era Denmark. The childish and begrudging King Christian VII, his Queen Caroline who marries into the royal family Marie Antoinette-style from England, and the brooding physician Johan elected to the king’s services, create one of the most dynamic triangular relationships in recent cinema. A Royal Affair is set in 1760’s Denmark, one of the last bastions for Feudalism and Clerical reign in politics, at a point where that conservative tide begins to shift (enabled by a perfect storm of circumstances). Though steeped in an 18th Century context, the philosophical content, the handheld manner of shooting, the cool tonality, the relationships, and the contemporaneity of social-networking to those of the present day, all work together to make A Royal Affair a surprisingly modern experience. The story begins with Caroline Mathilde (Alicia Vikander) of Great Britain’s transition into Danish Court Life as she weds Christian VII. Form the outset, Caroline seems to be the center of the film, which suggests a Marie Antoinette likeness in the prejudices, losses, and general malaise that she experiences. This is thankfully not the case, as the character of Christian, and Johan Struensee (Madds Mikkelson of Casino Royale) exert their importance. Christian is a disturbed individual. He exhibits qualities one might associate with someone suffering from Aspergers, and has a clear disinterest for his role as King other than the entitlement it offers. Mikkel Folsgaard is a revelation, who in his first screen role, achieves a memorable balance of exaggerated states and subtle cues. His behavior is lude, and his attitude is adolescent. And for Caroline, whom he seems to have little interest in, he is a nightmare of a partner. Her only solace is her children and her ideas, which have a kinship in Johan Stuensee, the doctor/ underground Enlightenment intellectual commissioned to be Christian’s personal physician. Christian and Johan’s relationship is fascinating, not least of which because the king’s mental illness what actually enables Johan to enter into the political sphere and effect change interiorly. Though it bears marks of manipulation – with Struensee building up Christian as a mouthpiece for enlightenment style socio-political maneuverings – there is a purity between them. Struensee, ever calm, if not stoic on the surface, has the ability to see Christian for what he is (ultimately a very unhappy person), and is able to offer him what it is that he needs and wants out of life, theater. Above all else, Christian is a theater buff, and loves nothing more than to perform, quote, and flaunt conventions of his posturing lifestyle. Stuensee empowers Christian to propose actual ideas and laws in the council. When Christian delivers his well rehearsed lines and these words actually take effect in the real world, he lights up from within. The court is no longer just a boring assemblage of old men pontificating, but an environment where real change can happen. Stuensee also upholds a position of fraternal love for Christian, like that of an older brother that is able to diffuse the King’s tantrums and bring him back into focus, or if not, is able to distract him in just the right way. Caroline becomes more and more isolate from everything…… that is to say, except from Johan. The intellectual spark gives gradual way to a physical one. The consequences of this affair are complex, and better experienced, as they are entwined in larger scope of political change that Johan has helped to create. It also threatens to shatter the psychological progress made by Christian, who is slowly being manipulated by vengeful council members and clergy who aim to dissolve the progress of the enlightenment and reinstate Feudalism in-full (even though the rest of Europe is essentially flourishing in progressive thought and practice, like free-speech). I was taken in by A Royal Affair, by virtue of its rich characterizations and relationships, and the savvy of its writers to reflexively incorporate the drama of those tenuous bonds into the fragile politics of the time (as they are indeed inseparable). The mood is well set, the environments transportive, the fever of hopeful progress is infectious and familiar….. and the damn thing just looks so good. 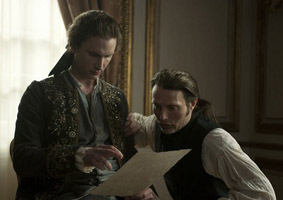 A Royal Affair is now playing at the Ritz Five.